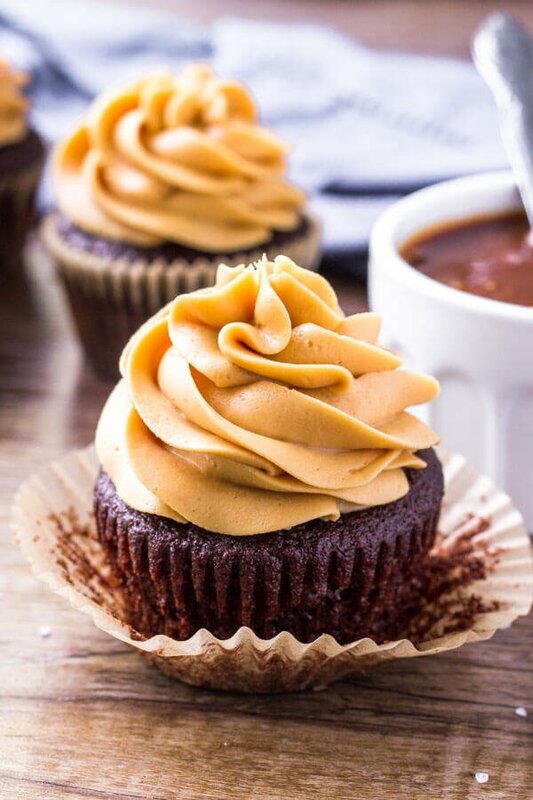 Get ready caramel lovers – these chocolate cupcakes with caramel frosting are for you. 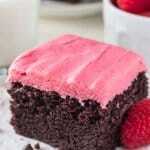 They start with moist, tender chocolate cupcakes with a delicious chocolate flavor. Then they’re topped with creamy, fluffy, extra dreamy salted caramel buttercream. There’s a famous cupcake shop in Seattle called Cupcake Royale. They have some of the best cupcakes I’ve ever tried – they’re moist, soft, piled high with frosting, and basically heaven in adorable cupcake form. Plus, you can get a delicious milkshake to go with your cupcake. Because clearly, that’s very necessary. The last time I was in Seattle I did some very strenuous taste test. And after a very scientific, meticulous study – their chocolate cupcake with caramel frosting was my favorite. It has a soft cake crumb and delicious chocolate flavor that’s rich without being overbearing. Then it’s topped with thick, creamy salted caramel buttercream that’s somewhere in between caramel sauce and caramel fudge and out of control delicious. So today – I’m sharing my version of these chocolate caramel cupcake delights. and buttermilk for the softest crumb. I never use oil in vanilla cupcakes (you need butter for more flavor). But you don’t need the extra flavor in chocolate cupcakes. 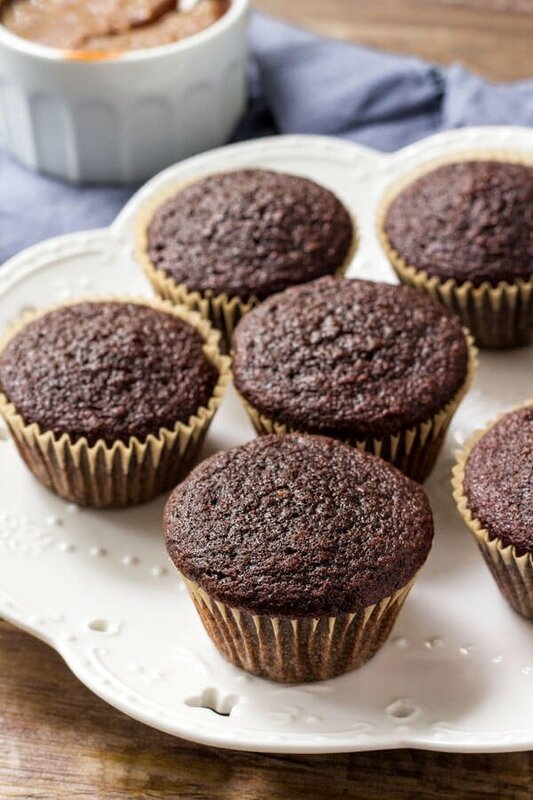 And since oil is liquid at room temperature instead of butter (which is solid) – oil is perfect for chocolate cupcakes because it keeps the crumb so moist and light. Then buttermilk is key for a soft, delicate texture with zero dry cupcake crumbs. 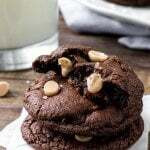 Then for the best chocolate flavor, we only need cocoa powder for this recipe. I like to use dutch process cocoa for a richer taste. Then we’re adding boiling water to the batter because it makes the cocoa “bloom” which basically means that it intensifies and improves the chocolate factor. Then for the caramel frosting. Ok – it’s delicious. It’s rich. It’s filled with caramel goodness. And it’s soooo creamy. 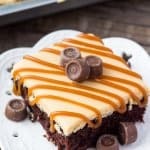 I’ve seen quite a few caramel frosting recipes that use brown sugar – but did you know that the difference between caramel and butterscotch is that caramel uses white sugar and butterscotch uses brown sugar???? So for the best, most caramel-y, caramel buttercream we need to use white sugar. We start off by making salted caramel sauce. 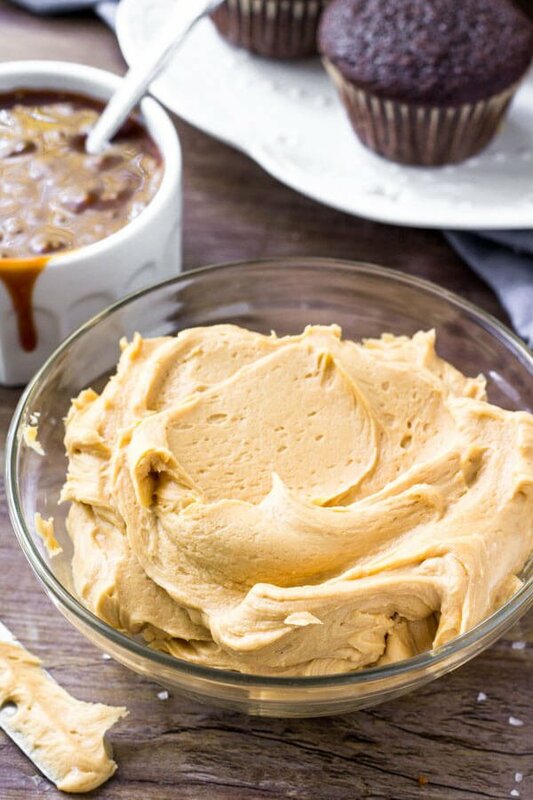 For this frosting it’s best to use a thick caramel that’s a little darker in color. So I’ve adapted my favorite salted caramel sauce recipe for you. If you want to save time you can buy premade caramel, just make sure it’s high quality and thick. From there – making the buttercream is easy. Beat the butter until fluffy. Then mix in half of the powdered sugar, followed by the salted caramel, vanilla extract & salt. Beat in the rest of the powdered sugar about 1/2 cup at a time alternating with 1 tablespoon of whipping cream. Then it’s time to pile ’em high with frosting. Use a piping bag or knife, then optionally add a drizzle of caramel sauce. 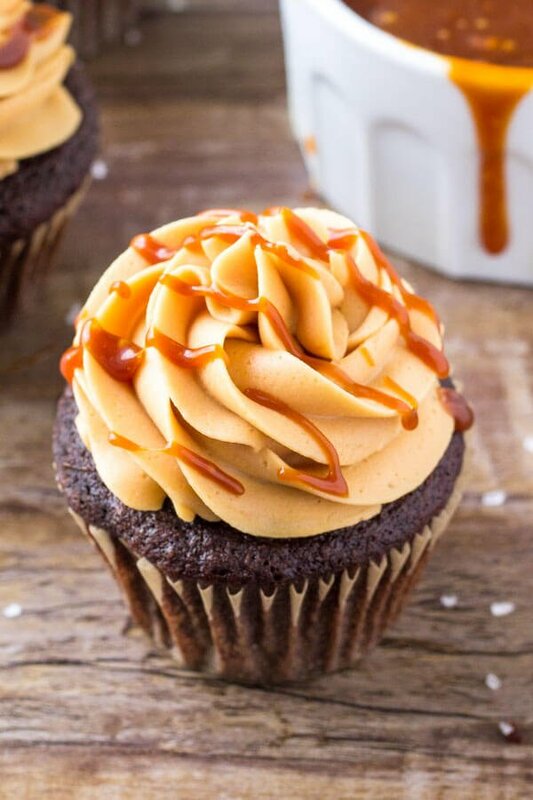 These chocolate cupcakes with caramel frosting are pure heaven if you love salted caramel. The soft chocolate cupcakes is the perfect pairing for sweet, creamy, fluffy caramel buttercream. And if you’re looking for a cupcake that’s a complete showstopper – then these are definitely for you. 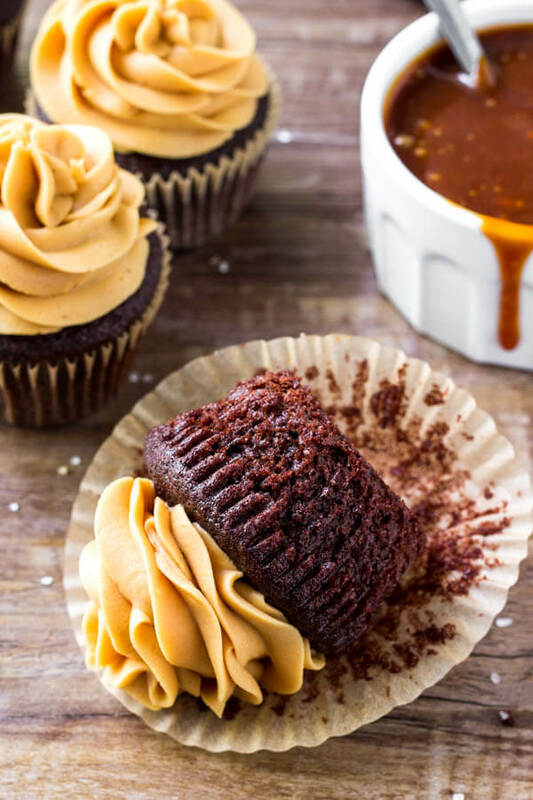 These chocolate cupcakes with caramel frosting are the perfect for true caramel lovers. The chocolate cupcakes are moist with a soft crumb and delicious chocolate flavor. Then the caramel buttercream is creamy, sweet & completely addictive. In a medium bowl whisk together the flour, cocoa powder, baking soda, baking powder & salt. In a large bowl using an electric mixer, beat together the oil, sugar, egg, and vanilla extract (about 1 minutes). Carefully beat in the buttermilk. Mix in the flour mixture about 1/2 at a time, turning off the mixer and scraping down the sides of the bowl in between. With the mixer on low speed, carefully beat in the boiling water. Bake for 16-19 minutes, or until the tops feel slightly firm to the touch and an inserted toothpick comes out clean. Add the sugar to a medium saucepan over medium heat. Heat the sugar while whisking constantly. After a while it will form lumps - then turn into a smooth amber colored liquid. Gently whisk the mixture until it's smooth and dark amber color. Be careful or else your caramel can burn. Carefully whisk in the chopped butter until it's fully melted (it will bubble up). Remove the pan from the heat and whisk in the whipping cream. Then stir in the vanilla extract & salt. Beat in 2 cups of powdered sugar, starting with the mixer on low and then turning it up to medium as it incorporates. Mix in 1/2 cup salted caramel sauce (you won't need all that you made). It must be 100% cooled before adding it into the frosting. Beat in the remaining powdered sugar about 1/2 cup at a time, alternating with 1 tablespoon of cream until the desired sweetness and consistency is reached. Frost the cupcakes using a knife or a piping bag (I used a 1M tip). Optionally, drizzle each cupcake with more salted caramel sauce. *If you don't have buttermilk, add 1 teaspoon of vinegar to 1/3 cup milk. Let it sit for 5 minutes to sour before using. **Store cupcakes in an airtight container at room temperature for up to 3 days, or in the fridge if your kitchen is warm. Unfrosted cupcakes can be frozen and thawed in the fridge. Leftover frosting can be stored in the fridge in an airtight container. Let it sit at room temperature to soften before using.